Tags: High Stakes, Justin Bonomo, Phil Ivey. Thanks to his consecutive and incredibly huge wins recently made just at the first half of 2018, Justin ‘ZeeJustin' Bonomo currently sits at the 1st spot at the United States All Time Money List according to The Hendonmob website. His total live earnings are more than $43 million, and his Best Live Cash is a whopping $10 million (he won 1st place at the 2018 WSOP $1M NLHE - The Big One for One Drop on July 15). His most recent cash was in September 12 at the 2018 Poker Masters Event #6: $52,000 NLHE in 6th place ($141,000). In 2005, Justin Bonomo was the first teenager to appear on TV at a poker event (EPT French Open). While Phil Ivey has been making headlines earlier due to his skirmish with a casino regarding edge sorting in which he apparently lost, his skill and talent at the poker tables is still unparalleled. He's in 5th place at the United States All Time Money List with total live earnings of more than $26 million, and his Best Live Cash is $3.5 million. His most recent recorded cashes were from the 2018 WSOP: Event #7 Colossus $565 NLHE (533rd place for $2,048), Event #21 Millionaire Maker $1,500 NLHE (1024th for $2,345), Event #33 $50,000 Poker Players Championship (9th place for $111,447), and Event #65 $10,000 NLHE Main Event Championship (547th place for $23,940). In 2017, he was elected to the Poker Hall of Fame. It was in December 1998 when Phil Ivey made his first cash ever in a live tournament. Let's get back to their cards now, shall we? There were 11 players left during preflop, the action being five-handed with blinds of 100k-200k and a big-blind ante of 200k. Phil Ivey raised to 500k from the cutoff. Justin Bonomo called from the button. Ivey bet 500k on the flop, and Bonomo called. Ivey bet 1.4 million on the turn, and Bonomo called again. 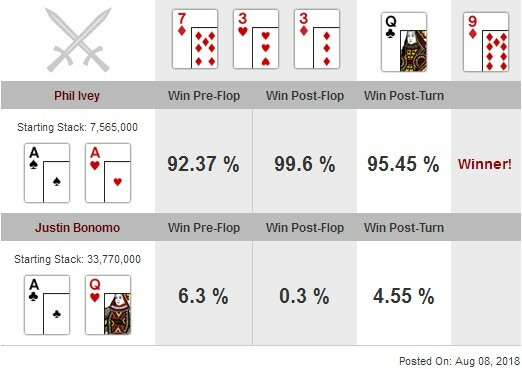 Ivey checked on the river, Bonomo went all-in. Ivey called all-in as well for 5,170,000. This is only one of the many times that Phil Ivey and Justin Bonomo crossed paths in a poker showdown. Here's a cool video of them last year at the National Heads-up Poker Championship held at the Caesars Palace casino in Las Vegas. Watch and find out who won in the end. 14 comments for "Poker Showdown: Phil Ivey versus Justin Bonomo"
A bit rash to go all in on the river, when the board made a flush possible. But interesting play by Ivey. Quite low bet on the flop, as to not lose his customer, and then inducing a move by his opponent with the check on the river. But of cause he was lucky that his opponent hit the turn. well this kind of show can be something for marketing,you dont have to be for real money!I dont say that this wasnt real money,just that you can make this kind of heads up just to make popular show and to bring more players to poker tables! Two do the bets poker players indeed. earnings. And a quite big number form live winnings also. Never expected it to be that high. An impressive career so far, and he is still young. Yet Ivey does not have any notable place/real topten finish from the last couple years or so. Seems that the tourney flow has left him behind ever since he started to concentrate on his cash games only. If i make a peppered joke, about the two professional poker players which are among the best from the world, i can say there are two cheaters at the table. One cheated in casinos and the other in online poker room or rooms. Even if they have cheated in the past, are players who have impressed a lot. Phil ivey was lucky with 88 vs 66 and AQ vs AJ and won. Good for him. Both very good players but Justin better than Ivey in tournament those last days but heads up I believe Ivey still has an edge over Justin. 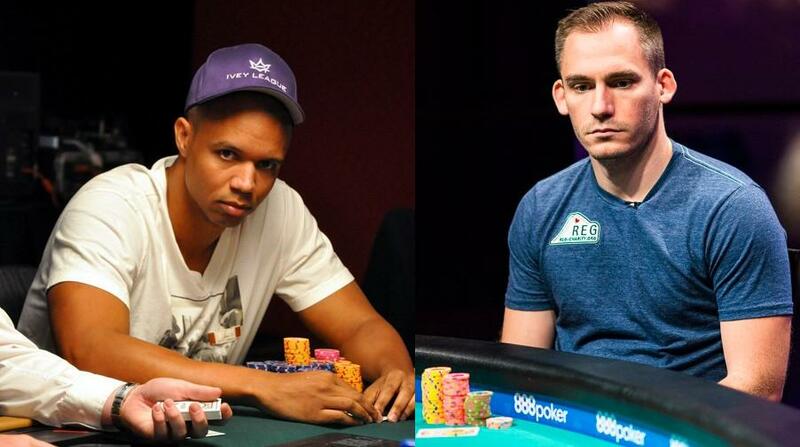 Phil Ivey is a older poker player with a very beautiful career and 10 bracelets, but Justin Bonomo has won in a few years more than Ivey won in his entire career. Two outstanding players who have made history. 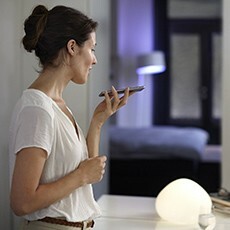 It is remarkable that they have not played this game tight but they left the game more relaxing. Two outstanding players who have made history. It is remarkable that they have not played this game tight but they left the game more relaxing. I think Ivey play up to his opponents when heads up. Seems that he always want to beat them with in their own style rather than doing what he is known for... This was a great show but a bad matchup. Phil Ivey is a big player and when he wants to beat opponents in their style and succeeds this thing, satisfaction is great. This also happens in other games or sport games ( I understand that poker is also considered a sport but i do not have that opinion ). Phil Ivey is a special character when he tries this.